Below is a brief description of the service and its main concepts. RSS Ground is all in one content processing service. In RSS Ground you can search for high-quality content from all major content providers all over the Internet. Moreover, you can automatically post discovered content to your blogs or social network profiles, as well as display this content on your websites. Before you start using the service, please learn more about RSS Ground main concepts. In RSS Ground we use content feeds (RSS feeds) to provide you with fresh and targeted content. Read more about content feeds. 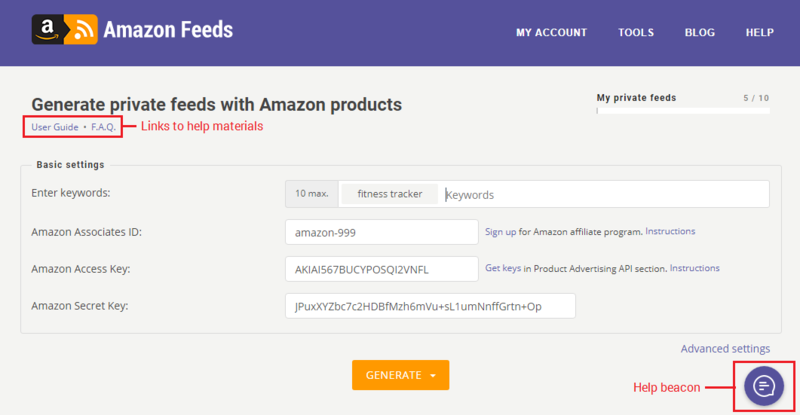 All your searched and generated content feeds saved in personal Feeds Box. Read more about Feeds Box. To follow the latest updates and news from your content feeds you need to use Feeds Reader. Read more about Feeds Reader. To automatically post targeted content to your blogs and social media accounts you need to create posting campaigns. Read more about posting campaigns. To display content on your website you need to create content widgets. Read more about content widgets. MY ACCOUNT page is the main section of your RSS Ground user account. You get there as soon as you log in to the service. From MY ACCOUNT you start discovering fresh content, managing searched and generated content feeds in Feeds Box, Feeds Reader, posting campaigns and content widgets. To navigate across the service you can also use the main menu. 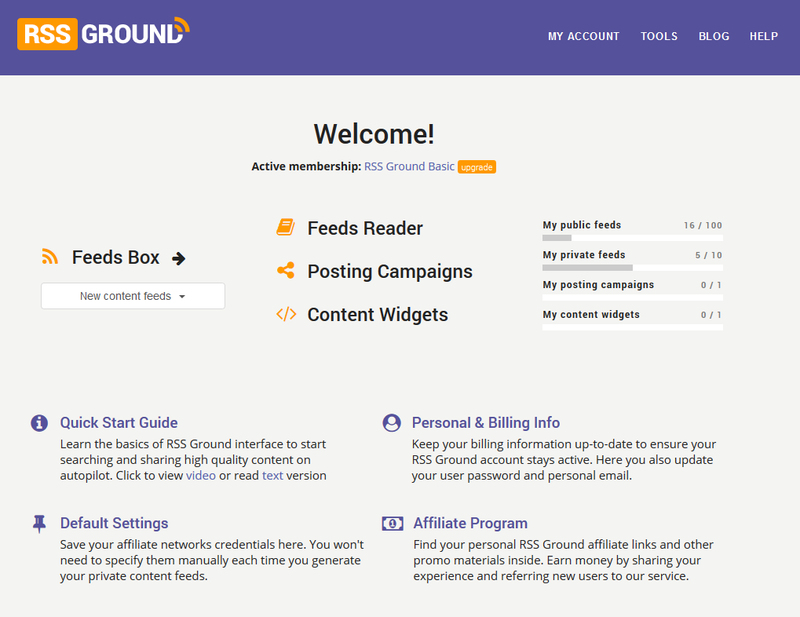 RSS Ground uses content feeds to deliver fresh and targeted content from content providers to end users. Content feed is a conveniently structured self-updating file with fresh targeted information from a particular content provider. 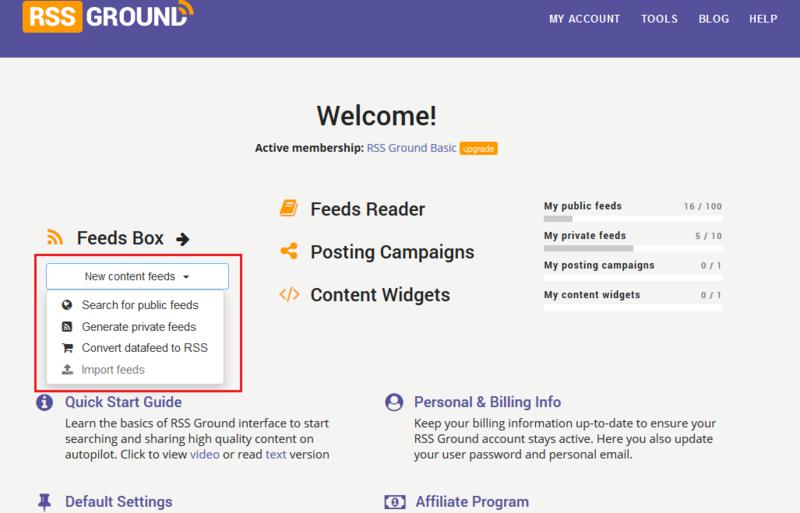 In RSS Ground you can generate private content feeds - unique content feeds based on your search keywords, content filters, and content sorting. Or search for public content feeds - original content feeds from various content providers with public access on the Internet. To start searching for new public feeds or generating new private content feeds use New content feeds option in MY ACCOUNT. Choose if you wish to search for public feeds or generate privet feeds from a particular content provider or from a datafeed. When you search for public feeds or generate your private content feeds you use keywords. Depending on a content source you can also use different basic and advanced settings. Advanced settings are optional and used for a more specialized or more targeted search results. If you have any questions on how to search for targeted content from a particular content source you can refer to user guide or FAQ. Also, you can use Help Beacon to search our knowledgebase or contact our support team. When you search or generate content feeds you save them to your Feeds Box. However, you can also choose to immediately add them to Feeds Reader, to a new or existing posting campaign or content widget. Add to a Content Widget - to create a content widget to display content feeds on your website. 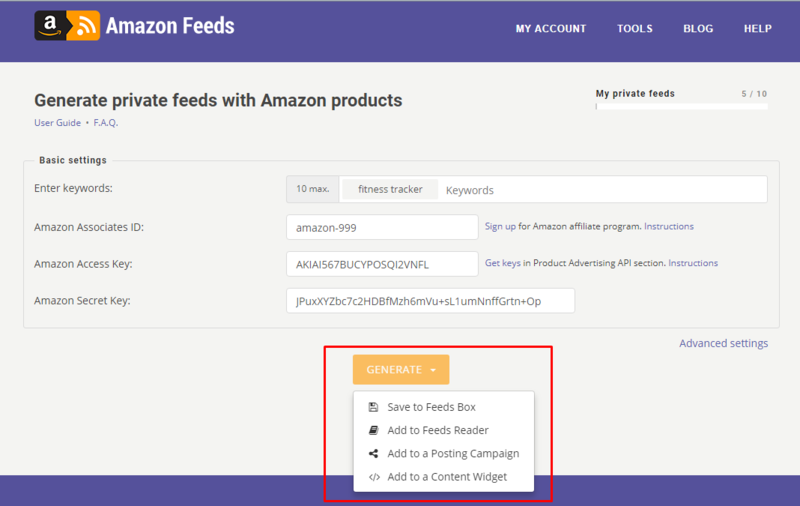 When you choose to add feeds to Feeds Reader, create a posting campaign or content widget they are still automatically saved to your Feeds Box. To manage your content feeds in Feeds Box, Feeds Reader, in posting campaigns or in content widgets you go to MY ACCOUNT or use the main navigation menu, and choose a needed section. The number of saved content feeds, created posting campaigns and content widgets are limited according to your membership level. If you hit the limit you won't be able to search for more public content feeds or generate more private content feeds, create more posting campaigns or content widgets. To proceed, you need to delete one of your saved feeds, posting campaigns or content widgets. Alternatively, you need to upgrade to another membership plan with higher limits. These are the basics to help you to start using the service right away. You can refer to these Quick Start Guide any time you want. Find the link on MY ACCOUNT page. For more detailed information about the service, please refer to our comprehensive Knowledgebase using Help menu or help beacon. To change your password and other personal information use Personal & Billing Info section. 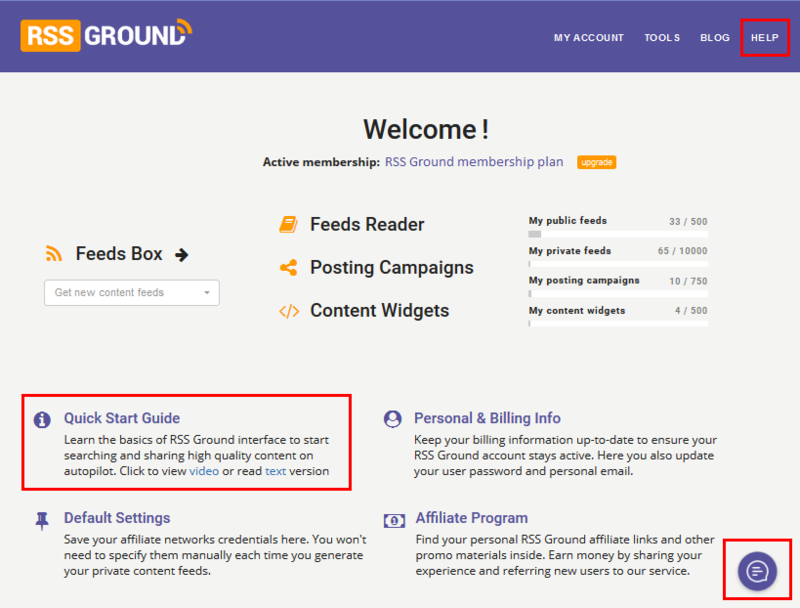 Here you can also find information about your RSS Ground subscription and all recurring transactions. Follow all the latest service news and updates on our blog. You will also find other useful articles on Internet marketing there. We wish you the best experience using RSS Ground service!